Its undoubtedly a continuing global challenge that the efficiency in the construction industry has been elusive in spite of all the investments in research, training and technologies to keep the nose above the water. Governments, companies and research institutions have been spending millions in technologies of the future like 3D Virtual Reality, 3D printing and extreme modularization which have limited and non-scalable consequences to the productivity problem. Apple HQ and the Berlin Brandenburg Airport in construction..
High profile projects such as the tech firm’s new headquarters in Silicon Valley, or the Berlin Brandenburg airport have experienced serious delays of over 2 years and budget overshot of billions of dollars. (see Economist’s article). Consultants like McKinsey and Boston’s Consulting Group have more than once reiterated the fact that the productivity of construction has performed poorly than manufacturing and agriculture. 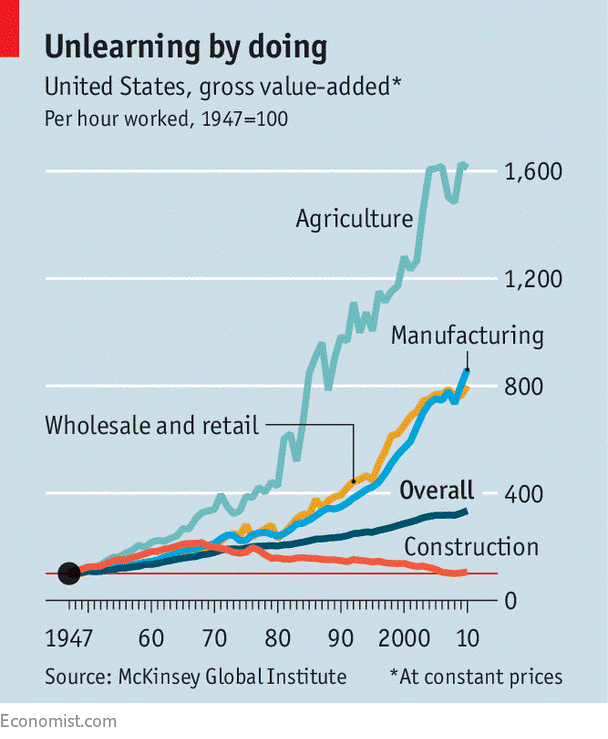 (see McKinsey’s article and BCG’s article) Though this is a reality and a true fact, but a comparison of construction with other industries especially like manufacturing is not the right way to look at the real picture. Manufacturing and construction from the outset look similar when looked at from the process perspective. Both have design, production and testing stages. However, there is one critical difference that completely renders this comparison useless. Design in manufacturing results in millions (if not billions) of products being produced from the production and testing stages in comparison to the only one building, a dam or an airport coming out of every design stage in construction. The beauty of mass production comes from the fact that the cost of design is elegantly shared across all the multiple products that are sold to the millions of people worldwide. This beauty is seen in agriculture whether in efficiency in production or storage or distribution. There is no space for such a beauty in construction, and it continues to be the beast. Labor plays another major factor in construction, most of the site work cannot be or will not be replaced by robots or autonomous systems. Whether it’s a question of cheaper labor or technology being impractical on-site, the lack of adoption and lack of any potential to scale prevents such technologies to have any impact on construction productivity. It’s a fallacy to compare construction to any other industry as it is a unique beast and needs its own set of correctives and remedies. Labor intensive countries across the developing worlds like China or India have always had this problem of collaboration or the lack of it in its workforce. Promoting a collaborative culture and commitment culture across the workforce has never been more important than now. A workforce that understand the context of the work, a workforce dedicated and committed to the project / organizational objectives and a workforce that supports one another is the long-term answer to this productivity puzzle of the construction industry. In the medical history during the medieval times, the controlled clinical tests allowed the medical researchers to arrive at conclusions based on true evidences. Medical industry prior to this, was heavily dependent on assumptions, gut-feels and best suited answers. In the middle ages, the most common assumption in was that God was punishing mankind for its sins or due to demonic dogs. Some people even accused the Jews of poisoning wells. Scholars attempted a more scientific view, but they were hampered by the fact that the microscope wouldn’t be invented for several centuries which ultimately revealed the true source. (See article on Black Death). Construction projects need a real-time microscope, it needs a framework for management allowing the dynamic nature of works and inputs from the hundreds of people on the site. It needs a comprehensive planning and analysis system that allows the project managers to get a realistic view of the project and take decisions based on rational and practical conditions. With changing times, the framework needs to be agile and provide for a continual improvement. Lean PlanDo is the answer to the construction productivity puzzle. Lean PlanDo a planning and control framework for construction productivity. Lean PlanDo is that corrective that allows the managers to control the wastes in processes. It’s a preventive that allows them to tackle and eliminate conflicts and issues. Singapore has been a great place for a controlled clinically test for Lean PlanDo where it has excelled. In many of the complex projects its been involved in. It’s now time to meet the world out there. Lean PlanDo — a real and practical tool for improving construction productivity. What does it feel like working in Lean Station?